The sixth batch of buses transporting hundreds of terrorists and their families left from al-Rastan Bridge and al-Mokhtariya village and headed to Idleb countryside on Monday, as part of the agreement for ending the presence of terrorists in Homs northern countryside and Hama southern countryside. A local correspondent in Homs said that 59 buses carrying hundreds of terrorists and their families have left al-Samalil village in the northern countryside of the province, heading to al-Mokhtariya village and then to Idleb. 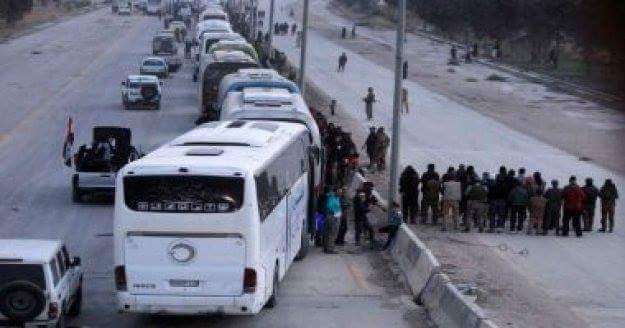 In Hama province, the local correspondent said that 63 buses left after having been gathered at al-Rastan Bridge, and were transported to Idleb in two batches in the evening. The buses have been subjected to thorough inspection to prevent terrorists from smuggling mines, explosive devices, or weapons, as well as to prevent them from taking any civilian as hostage under threat. Medium weapons, explosive belts, machineguns and mines were seized during the inspection process, said the correspondent. The fifth batch of terrorists left Hama and Homs on Sunday on board 73 buses, and it is expected for the last batch to leave on Tuesday, ending the presence of terrorists completely in Homs northern countryside and Hama southern countryside.